We are facing a major growing pain in current society. We seem to be unable to deal with issues from the past through the lens of our current societal norms. In an article from CNN, “Laura Ingalls Wilder’s name has been stripped from a prestigious book award because of racist themes,” we are rejecting the good works of an author because she spoke in the vernacular of her times. It is unrealistic to assume that we will ever achieve a perfect union just as it is unrealistic to hold our ancestors to the standards we have already achieved. As a child grows, we make marks on the wall to indicate progress just as we collect the art, history and stories of our past. We should not erase those marks. They are our institutional memory and they remind us not to make the same mistakes. It is a teachable moment to educate young readers that in the past, the process of forming a more perfect union includes remembering that the good people of the past did bad things by todays standards. Not only does a child learn right from wrong, but so does society. In order to form a more perfect union, we must look at these events from the past as benchmarks of our progress. We must also realize that the events of today will plant the benchmarks of progress toward our future. On a related note, we are now going through a transition in the workplace. It is no longer acceptable to treat men and women as other than fair and equal colleagues without regard to gender. As more offenses come to light, we feel free to condemn and reject those who have committed offenses in the past. There should be no statute of limitations for this condemnation of criminal acts from the past. Forgiveness of non-criminal acts should be earned. But we are a forgiving society and there should be a road forward for those whose bad behavior was only in the distant past. We must keep the marks on the wall that indicate our growth. We must erase the bad behavior in the present. Most importantly, we must keep the memories of the past both good and bad. I am staying at Extended Stay North which has “Free Wi-Fi” provided by InnFlux. It is a total ripoff. Every one of their competitors provides enough speed to stream video from all of the popular services. Except InnFlux and Extended Stay. They charge a premium for average speed wi-fi. Hulu, Apple Video and youtube will not even stream low quality video over Innflux at Extended Stay. They say they cater to business customers but not if they have to pay a premium for acceptable speed. Don’t stay at Extended Stay if you want acceptable wi-fi. Here is a great way to promote you teams on Game Day. Create a one sheet program that contains basic information about the game and about your teams. NCAA schools create these for every single game in every sport. The programs for large sports at large schools are many pages but the Olympic sports at all schools have a one sheet program. Team Schedule in three columns including date, opponent (at if away game), and a third column with previous scores and times for upcoming games. Rosters for both teams in numerical order. Number, name, position and class. College Rosters include Hometown/high school. Above the columns, the Overall and Conference record. Below, the coaches and Head coach longevity. I have been a Public Address Announcer for 37 years and these are invaluable. Website and social media addresses. Remaining space for graphics, photos, logos and possibly sponsors. You should distribute 10 copies to the pressbox for game day personnel and media. You can then distribute enough to those attending or sell them for 25 or 50 cents at the gate. Below is an example from Emerson College Mens Soccer. 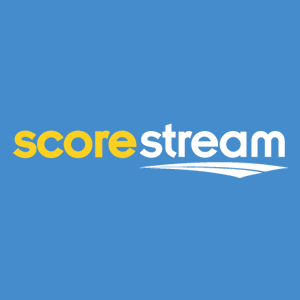 I have used ScoreStream for five years to promote my high school’s sports program. SS connects with the most popular social media outlets with the score, photos, commentary, fan comments and of course likes. 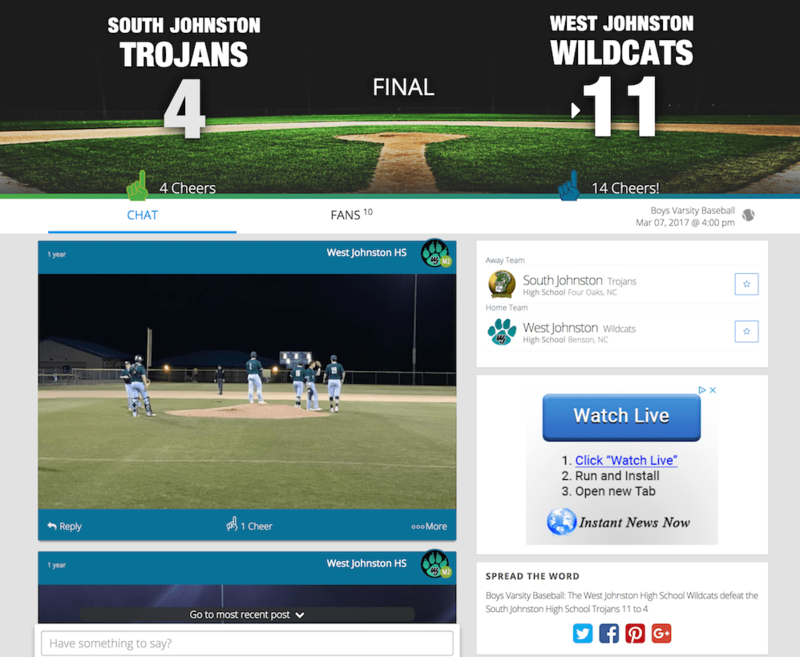 At the most basic, scorestream presents a page that allows you to enter the score in real time or postgame. In most markets, the games in the major sports appear automatically. You may have to enter the games in your Olympic sports manually. That is rather easy. Run the app on your IOS or Android phone and you can add photos and video during the game. On your high school WordPress website, you can easily add a widget that displays a list of the most recent scores. If you become a GM for your school, you can customize own look for your schools score pages. ScoreStream is the ideal tool to promote your school and your teams. EverNote Notebook on Sports Statistics and Marketing. In the spring of 1970, I was a student at Westerville High School and a cast member of the spring musical under the direction of Ron Nocks. On one Thursday evening rehearsal, I was neither an experienced actor nor a talented one and I was most certainly not able to act as if I was not afraid of heights as I carefully climbed down a naked flight of stairs onto a raked stage wearing a helmet obscuring my vision. Later on, as a teacher, I would have hoped that I could have cared enough to individually help a student through a difficult problem and possibly even help them gain confidence. I know that many of my students would agree that I was that caring teacher. I know that some would not. That evening, Ron Nocks was not that caring teacher. At the rundown that evening in Room 201 in the presence of the entire cast and crew, he publicly dressed me down for my lack of confidence and my lack of courage. He used his wicked and well-honed sarcasm to embarrass me and make me an outcast among kids who had been my classmates and neighbors since kindergarten. Specifically, he asked me if my toilet was closer to the floor to compensate for my fear of heights. I was never a victim of sexual abuse by Mr. Nocks or anyone else. I know that most of the students in that room loved and worshipped Mr. Nocks. To a man with the ego and talent such as his, it leads him to appreciate the hero worship among his favorites and sometimes to take advantage of them as he has admitted. It also leads to an arrogance that allows him to verbally abuse the students who were not his favorites. It is this collection and exercise of raw personal power toward subordinates that has become such a difficult issue at present. I do not desire nor expect an apology. If he is in such a mood, maybe he could join me in apologizing to my students who received some of the same sarcastic treatment because that night in Room 201, he set an example and gave me, a high school junior, permission to act that way to my students in the future. That is the crux of this problem. That is the chain of abuse that goes from generation to generation. I will never receive justice nor will any other victim of the abuse of power by those with talent and position. But if there is justice to be paid, follow the advice of Coach Hayes and Pay it Forward. Don’t abuse. Don’t accept abuse and don’t tolerate it towards others in your presence or in your organization. That said, there is a paradox. Before and even after that night, I was a fan of the work of Mr. Nocks and I attended his plays. More specifically, I admired and emulated him as a public address announcer during the morning announcements and I became a very accomplished sports public address announcer in San Diego. That’s the rub. That’s the quandary. That is the love-hate relationship we have in our society with people who have immense talent or power. But, that night, he hurt me.